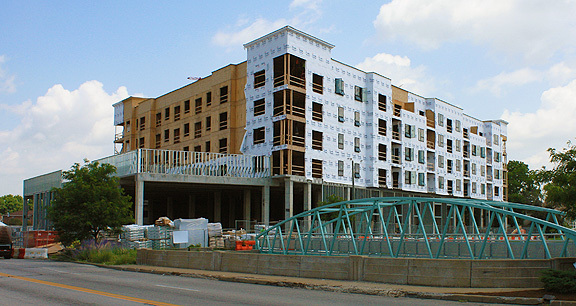 Project obstacles and solutions: The Coil is a mixed use apartment building and grocery store built along the Broad Ripple Canal in Indianapolis, Indiana. The $37 million project includes 131,000 square feet for 151 high-end apartments, 33,500 square feet of retail space that houses the Fresh Thyme Market, and a four-level parking garage with 350 vehicle spaces. The unique design incorporates wood framed apartments sitting atop a concrete foundation and frame on the lower level. There were several public hearings on the Coil project as residents voiced opinions both for and against constructing it. This delayed the start of construction by several months. Browning went through a redesign of the facility before it received approval to proceed. Ground was broken in May 2015. With 16 months of construction until completion, Browning needed to keep the construction schedule on this project moving. IMI supplied 6,000 yards of concrete for the foundation, first-level pillars and the first and second-level floors. They also supplied the concrete floors poured in the four-levels of the parking garage. These floors used post-tensioning reinforcement. They had to meet an early strength of 3,000 psi/24 hours (5,000 psi/28 days.) IMI QC/QA designed a mix that exceeded the early strength requirement in 18 hours. The retail space and parking garage at the Coil is scheduled to be operational in the fall of 2016. The apartments are accepting residents beginning in 2017. For more information on concrete for post-tensioned floors, contact the sales representative for the concrete plant nearest your location. Click here.